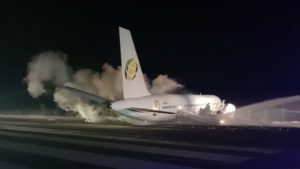 How not to market a new budget airline – don’t mention inflight alcohol or things that go bang. Watch candidates from The Apprentice shock British Airways executives with their daft ideas. The Airbus A330-800 takes to the skies for the first time, on a test flight from Toulouse-Blagnac Airport. Watch here. British Airways celebrates Diwali, India’s festival of lights, with a Bollywood-inspired performance of music, dance and light, at Heathrow. Watch here. Cork Airport shares the best moments from the SPAR Cork Airport Runway 5K. Watch here. Diwali time again – but in Dubai, celebrated by Emirates. Watch here. Etihad celebrates 15 years of sponsoring sports teams, including Manchester City. Watch here. It’s arrivals time for Heathrow’s Christmas bears ad. Expect it, like the others, to go viral. Watch here. Air New Zealand is heading for 2m hits with its acclaimed new safety video, featuring a 600-strong Kiwi cast. Another week of Brexit uncertainty was the prelude to the Let’s Talk Travel conference in Killarney. 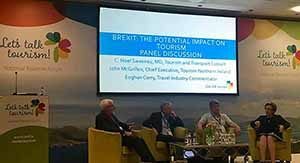 Watch here panel discussion on Brexit with Travel Extra editor Eoghan Corry where he talks about Brexitunities for the travel industry. Watch here Noel Sweeney presentation on Brexit. Watch here Margaret Cahill introduction to the conference. Watch here Paul Kelly presentation on Failte Ireland initiatives on regionality and seasonality which will be announced in full on Monday. Picture shows Noel sweeney, John McGrillen, Eoghan Corry and Olivia O’Leary. See more pictures here or connect with the album on Facebook. 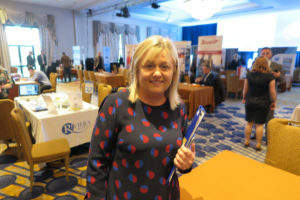 “The beating hearts of the travel industry,” is what Blaithin O’Donnell of Air Canada described the 150 agents who attended the 2018 Worldchoice conference at Lyrath in Kilkenny. The agents met 80 suppliers. Watch here Riona McGrath speaking at the Worldchoice conference. Watch here Michael English speaking at the Worldchoice conference. Watch here Declan Power’s hilarious speech at the Worldchoice conference. Watch here Carol Anne O’Neill speaking at the Worldchoice conference. Arrow Tours and Fahy Travel won the Worldchoice agency of the year awards. Picture shows Carol Anne O’Neill overusing preparations for the workshop. See more pictures here or connect with the album on Facebook. World Travel Market in London had its mixture of the old, the new, and even bizarre (Chernobyl tours). New exhibitors on the irish stand included the Vaults in Dublin, which has its grand opening on Wednesday. Watch here scenes from World Travel Market 2018 featuring personnel from the Irish outbound and inbound travel industry. Niall Gibbons gave the keynote address at the Irish stand reception and Minister Brendan Griffin visited the stand onTuesday morning. 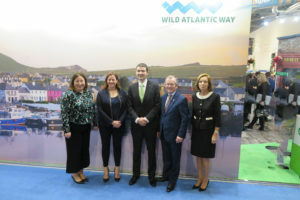 Picture shows Siobhan McNamany of Tourism Ireland, Julie Wakley of Tourism Ireland London, Brendan Griffin Tourism Minister, Niall Gibbons CEO of Tourism Ireland, Joan O’Shaughnessy chair of Tourism Ireland. See more pictures here or connect with the album on Facebook. Topflight launched its group ski trips, with a series of trips for January-March, including a Patrick’s Day party on the slopes. Carmen Mazzone, Maurice Shiels, Michelle Anderson and Shauna Kelly, Topflight, are pictured at the launch. Full story here. Best4travel and Bowe travel won the agency awards at the Travel Centres awards. See more pictures here or connect with the album on Facebook. Andy Harmer has been lobbied by various cruise companies to organise a separate CLIA mini conference in Ireland. Watch here as Tolene Van Der Merwe director of South African tourism in London describes her commitment to the Irish travel trade in an interview ast WTM, including more fam trips for agents. 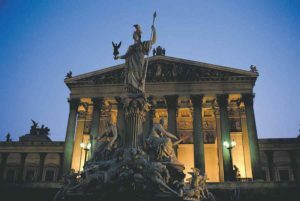 In advance of the ITAA conference in Philadelphia, Cordoba is being tipped as the venue for the 2019 conference. Thailand announced a waiver on the $60 visa-on-arrival fee from December 1 to January 31, for visitors from 21 countries. Sad news: Frank Tully the founder of Tully’s travel died last Saturday. Watch here Martin Skelly tribute to Frank Tully at the Worldchoice cponference. Watch here highlights of Travel Extra’s visit to KZN on the BA inaugural London Heathrow to Durban flight. Watch here highlights of a Visit USA fam trip to Baltimore & Washington with key Irish travel trade. Watch here highlights of the visit to Philadelphia hosted by Tony Lane of Visit USA and Jenny Rafter of Aer Lingus. Watch here as Rashmi Verma, secretary (head of department) of India’s Ministry of Tourism talks about her intention to double visitor numbers to India. Watch here report for Travel Extra from Anne Cadwallader in Kenya. Dave Conlon of Travelport is to join WTC in January. A cabin crew member breast-fed a crying baby when her mother ran out of formula milk during a flight. Delta has apologised after a passenger who had to sit on dog dirt was given paper towels and a small bottle of gin to clean himself up. Lebanon’s caretaker minister of tourism argued that Egypt is one of the dirtiest places in the world and that its population live in graves. Spain’s tourism minister met with tour operators to discuss contingency plans to ensure British tourists can still visit in the event of a no-deal Brexit. California is battling two massive wildfires – one near Paradise, in the north of the state, and one in the Malibu area near Los Angeles which has devastated movie sets. Spain is to examine its railway security after security in Barcelona x-rayed a bag containing what looked like a grenade – but somehow the woman travelled on to Madrid. The object was later found to be a belt buckle. 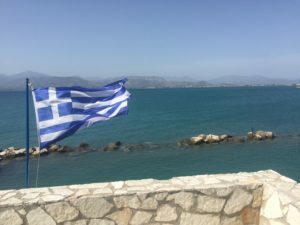 Greece is expecting visitor numbers to hit a record 33m this year, up from 30.2m in 2017. China is set to overtake France as the world’s number one tourist destination by 2030, according to Euromonitor. Sri Lanka Tourism launched its new brand identity, ‘So Sri Lanka,’ at Grosvenor House London Ballroom, to coincide with WTM. More than 300 people were arrested in New Delhi and 200 in Kolkata for flouting a court order only allowing “green firecrackers” during the Diwali festival, as the cities battle smog pollution. SeaWorld has refused to comment on reports that Six Flags Entertainment is in talks to buy all or some of its entertainment’s parks. If you want to avoid fellow tourists, head to Bangladesh, which has the world’s lowest ratio of visitors to locals, according to World Bank data mined by Priceonomics. Other non-touristy countries includes Guinea, Moldova, India and Ethiopia. Magaluf has been transformed from a lager lout resort to one where now 80pc of travellers are families, couples or adults, said Gabriel Escarrer, Chief Executive of Melia Hotels which has spent €250m to upgrade its hotels in the locality. The Irish drinks industry, which carries out over 23,000 truck movements across the border every year, fears post-Brexit checks could add an hour to journey times. 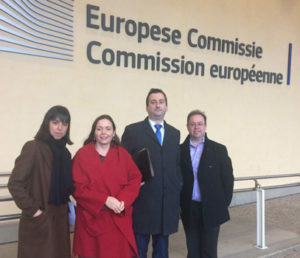 The delegation from the Alcohol Beverage Federation of Ireland are pictured at the European Commission to meet its Brexit team. Ballsbridge’s The Bridge 1859 pub – acquired by rugby players Jamie Heaslip, Rob Kearney, Dave Kearney and Sean O’Brien and publican Noel Anderson in 2014, made a profit of €313,000 during its last financial year. An Bord Pleanála has rejected plans to turn the Merchant’s Arch Bar in Temple Bar into a “superpub”. The North was named ‘Best Food Destination’ at the International Travel and Tourism Awards in London. Pre-tax profits at the firm operating the Powerscourt Hotel in Co Wicklow rose 77pc to €1.98m last year. Ownership of Kenmare’s landmark Sheen Falls Lodge is to be passed to a group of Thai investors. The Kildare House Hotel is on the market for €1.1m. 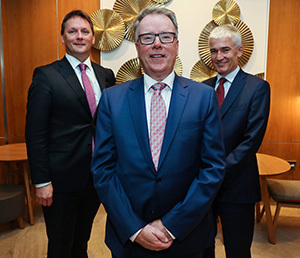 Earlsfort Centre Hotel Proprietors, which operates the Conrad Hotel in Dublin, has revealed that pre-tax profits rose 25pc to €2.23m last year. Dalata said its newest hotel, Clayton Hotel Charlemont, is set to open its doors on the banks of Dublin’s Grand Canal this November. 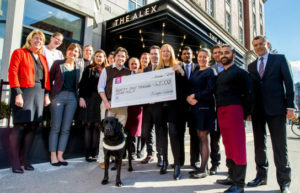 London’s Grosvenor House Hotel – the setting for the annual Irish Post awards – has been bought by the Qatar’s Katara Hospitality, which already owns New York’s historic The Plaza hotel. O’Callaghan Collection staff pictured after their day-long stint on stationary bikes and treadmills outside two of their Dublin city centre hotels, The Mont Clare Hotel on Merrion Square and The Green on St Stephen’s Green, to raise funds for Irish Guide Dogs for the Blind, Irish Cancer Society and Irish Hospice. Irish hospitality group Press Up Entertainment, headed by Paddy McKillen Jr and Matt Ryan, is searching for locations to establish its Dean Hotel brand across Europe. Dublin Airport are on course for 31.38m passengers in 2018, up 6pc in the year to date after a record October, up 9pc to 2.8m, with trans Atlantic up 17pc, Europe up 9pc, Britain up 4pc, Africa/Asia up 19pc. The French department of Charente ordered bailiffs (huissiers) to seize at London-bound Ryanair plane on Thursday evening on the tarmac at Bordeaux airport in a legacy duispute over the repyayment of state aid that the local government says is owed by Ryanair. over unpaid debt. Ryanair is to fly a seasonal Dublin-Bodrum, 2w from May 4 2019 under the Turkey Ireland bi-lateral as it extends into the traditional charter territory. Ryanair fly Dalaman 1w and Aer Lingus fly Izmir 3w. At peak 114,000 Irish visited Turkey. Ryanair carried 13.1m passengers in October up 11pc, of which 0.5m were on Laudamotion, 12.6m on its own network up 7pc. Moscow and St Petersburg were added to Ryanair’s network, apparently as part of their Air Malta codeshare. Feach anseo Eoghan Corry ag caint ar figuiri Ryanair. 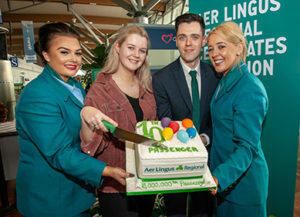 The Stobart-operated Aer Lingus Regional celebrated carrying its 10 millionth passenger. Pictured is passenger Aoife Twomey from Dingle, Co Kerry, with Ciarán Smith, Network Development Manager, Stobart Air, and Aer Lingus ground crew Jeanelle Tobin and Jo O’Riordan. CityJet and Brussels Airlines signed an agreement for early replacement of four Sukhoi Superjet 100 aircraft, on wet lease from CityJet until March 19, with four Bombardier CRJ900/1000 aircraft. Norwegian said it has carried more than 100,000 passengers to and from Shannon Airport to the US since July 2017. Shannon-based GainJet is to add threer more executive jet aircraft by year-end. A Flybe flight from Belfast City Airport to Glasgow fell 500ft in 18 seconds after an incorrect autopilot setting caused it to aim for the ground, an Air Accidents Investigation Branch probe found. Even America’s Fox News reported on the cunning tactic by Ryanair passenger Lee Cimino to avoid the new baggage charges – by sewing extra pockets in a massive coat. Ryanair launched two of its new winter routes from Dublin – to Frankfurt and Luxembourg – at a gate ceremony at the airport. 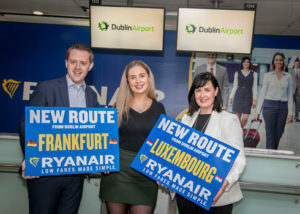 Dublin Airport Aviation Business Development Manager Brian Gallagher; Ryanair Marketing Executive Eimear Ryan; and Dublin Airport B2B Marketing Executive Edel Redmond are pictured at the airport. Ryanair also announced a new Dublin-Turkey route for Summer 2019. It also shut down its website and app for a stage. The City of Derry Airport’s service to Edinburgh Airport operated 5w by Ryanair launched. With oil prices rising, and transatlantic competition stiffening, Icelandair entered into a share purchase agreement to purchase all shares in the airline WOW air, subject to approval by Icelandair Group‘s shareholders and the Icelandic competition authorities. Planned two-way transatlantic seats for the week commencing July 31 2018 were: Aer Lingus 61,500, Icelandair 60,900, WOW 48,000 Norwegian 125,000. Departing transatlantic flights and seats (all carriers): Dublin 238 flights 60,991 seats; Keflavik 298 flights 65,879 seats. 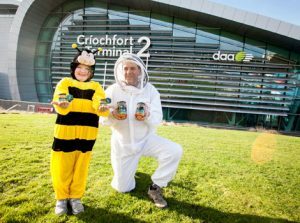 Honey produced in hives on Dublin Airport lands is now available for passengers to buy at the Marquette store in Terminal 1. Síle O’Kane (6) and beekeeper Colm Fogarty are pictured with the first batch of Nect-Air. 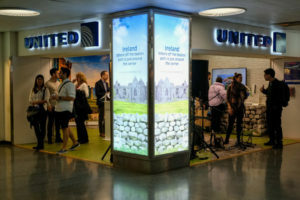 Unions at United Airlines say they will fight plans to cut one flight attendant from the Polaris business class cabin on international Dreamliner flights and one in the economy cabin on international 757 flights. Passengers on flights to London’s Heathrow Airport were delayed due to runway lighting problems on Wednesday. CAR Dublin Airport Q3 capital expenditure delivery update 2018 was released. Dubai is to open two cruise terminals in 2020 to accommodate up to three ships at a time as it expects to attract 1m passengers a year. The Port of Cork is looking for interested parties to construct and/or operate a new cruise facility after a record year of ship visits. Full story here. Viking Ocean Cruises is returning to Turkey in 2021, with a stop in the Irish favourite of Kusadasi. Norwegian Jewel has emerged from dry dock with new and redesigned cabins, venues and entertainment. Marella Cruises‘ summer 2020 programme will feature six cruises from England, to a mix of Iceland, Norwegian Fjords and Baltic itineraries. Two new fly cruises include the seven-night Aegean Explorer and the seven-night Mediterranean Secrets. 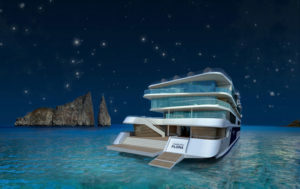 Celebrity Cruises’ Celebrity Flora, designed specifically for Galapagos Islands expeditions is to feature glamping under the stars at sea on the top deck of the small-scale ship when it launches in 2019. Virgin Voyages’ Scarlet Lady ship will feature over 20 food venues, all opening late, and without surcharges, the company said. MSC Cruises’ private Ocean Cay island in the Bahamas is now slated to open in November 2019. 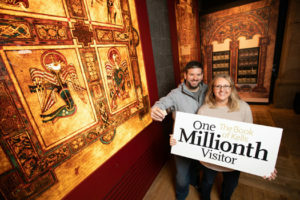 US tourist Cassie Clemans, who travelled with her husband Andy from Bend, Oregon, to celebrate their 20th wedding anniversary in Ireland, was named the millionth visitor to the Book of Kells in a record year. A no-deal Brexit crisis could cost Irish tourism as much as €390m – with thousands losing their jobs, Failte Ireland CEO Paul Kelly warned politicians. Watch the full video from the Oireachtas committe meeting on Brexit’s impact on tourism. Luas operator Transdev said drivers have had to use emergency brakes 223 times so far this year to avoid hitting pedestrians, and issued a warning to the public to get their heads out of their phones. Wexford’s Hook Lighthouse was ‘highly commended’ in the ‘Best Tourism Project’ category by the British Guild of Travel Writers at their annual World Tourism Awards ceremony in London. 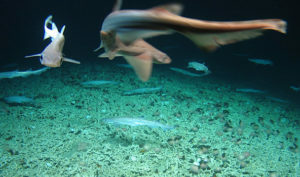 Video footage from the SeaRover has shown the largest shark nursery to have been found in Irish waters, discovered among cold-water coral reefs 200 miles west of the country. Insight Vacations offers: Highlights of Spain escorted tour, including flights, transfers, and 8 nights’ accommodation in central locations, was €2,519pps, now from €2,309 per person sharing, including flights, transfers, and 8 nights’ accommodation in central locations. Flight cost must be paid at the time of booking. 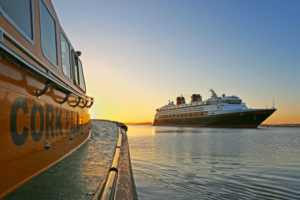 Book and pay in full by 28 February 2019, departs April 27, 2019. www.insightvacations.com or call 01 775 3803. Topflight offers: New group ski trips for 2019. Dublin to Andorra, for Party in the Principality, Arinsal and Pas de la Casa, from €699pps in Pasa de la Casa, depart January 13. From €599 for Arinsal, depart January 20, February 3 and March 17. Dublin to Austria, for Paddy’s on the Piste, Söll, from €699pps, depart March 16. Dublin to Italy, for Mountain Adventure Week, Livigno, from €653pp, depart January 26, February 2 and March 9. 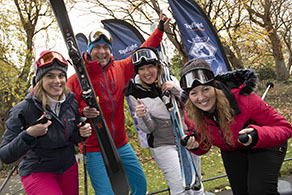 All prices include return flights, accommodation for 7 nights, return transfers, taxes, services of the Topflight in resort team and an activities programme including a selection of events such as quiz and games nights, mountain feasts, live music events, tobogganing, skidooing, ski races and apres ski parties. All participants will receive a jam-packed ski essentials goodie bag. www.topflight.ie, call 01 240 1700 or 028 9752 1168, or visit your local travel agent. TUI offers: Dublin to Algarve, 7 nights all inclusive 4* Be Live Family Palmeiras Village in Porches, from 2+1 €1,959, 2+2 €2,849, depart June 3. Dublin to Lapland day trips adult price from €549, child price from €449, depart December 8. Dublin to Costa Del Sol, 7 nights half board 3* Hotel Nerja Club, Nerja, from €509pps, depart November 18. 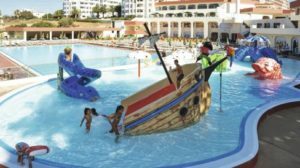 Dublin to Costa Blanca, 7 nights half board 3* Port Fiesta park, Benidorm, from €549pps, depart November 15. Cork to Costa del sol, 7 nights half board 3* Bali Hotel and Studio, Benalmadena, from €559pps, depart November 25. Dublin to Gran Canaria, 7 nights self catering 3* IFA InterClub Atlantic, San Agustin, from €759pps depart December 20. 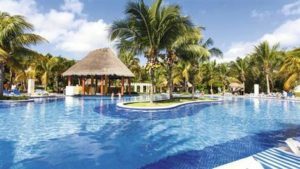 Dublin to Lanzarote , 7 nights all inclusive 3* Suneoclub El Trebol, Costa Tequise, from €999pps depart December 23. Dublin to Tenerife, 7 nights half board 3* Hotel Catalonia Las Vegas, from €819pps, depart December 21. Dublin to Gran Canaria, 7 nights half board 4* Hotel Riu Don Miguel, Playa del Ingles, from €479pps, depart January 24. Dublin to Lanzarote, 7 nights half board 3* Gloria Izaro Club Hotel, Puerto Del Carmen, from €489pps, depart January 27. www.tuiholidays.ie, call 1850 45 35 45 or visit a TUI Store/travel agent.